Das Apartment Xenia befindet sich in einer der ältesten Straßen von Rovinj, in einem Steinhaus im venezianischen Stil mit Blick auf das Meer. Es befindet sich direkt neben dem lokalen grünen Markt, wo Sie die besten istrischen Spezialitäten und 50 m vom Hauptplatz in Rovinj probieren können. Sobald Sie in Xenias Wohnung sind, ist alles vor Ihrer Haustür, nur wenige Meter entfernt - Lebensmittelgeschäft, Bäckereien, Kaffee-Morgen-Bars, Park, ausgezeichnete Restaurants, Museen, Fahrradverleih, Strand, sowie die Boote, die nehmen Sie zu den schönsten Inseln des Rovinjer Archipels. -Managed von CERTIFIED CROATIAN TOURIST GUIDE - meine Hilfe ist ständig während Ihres Aufenthalts verfügbar! Die Wohnung ist sehr geräumig und der Besitzer Ksenia hat es mit besonderer Liebe zum Detail eingerichtet. Es besteht aus einem gemütlichen Schlafzimmer mit einem Kingsize-Doppelbett, einer Küche und einem Essbereich sowie einem lebhaften Wohnzimmer am Meer. mit separater Lounge mit Doppelbett für weitere 2 Personen. Perfekt für Paare und Familien, die das echte Rovinj erleben möchten! Bitte schön. My husband and I stayed in this fabulous apartment two weeks ago. Except for the tiny bathroom we loved everything about it! It's location is so fun, right above the city market.,and steps away from the waterfront. It has the shuttered windows that you open up in the morning to view the stunning Adriatic Sea. Our host, Zeliko,was unbelievable! From the moment we met him at the appointed meeting site to the moment we said goodbye, he couldn't be more nice, helpful and accommodating. He gave us all kinds of city information, suggestions, and recommendations. We had nearby parking and never moved the car from the time we got there to the moment we left three days later. We ABSOLUTELY loved Rovinj! It has wonderful restaurants and quaint shops and stunning views. 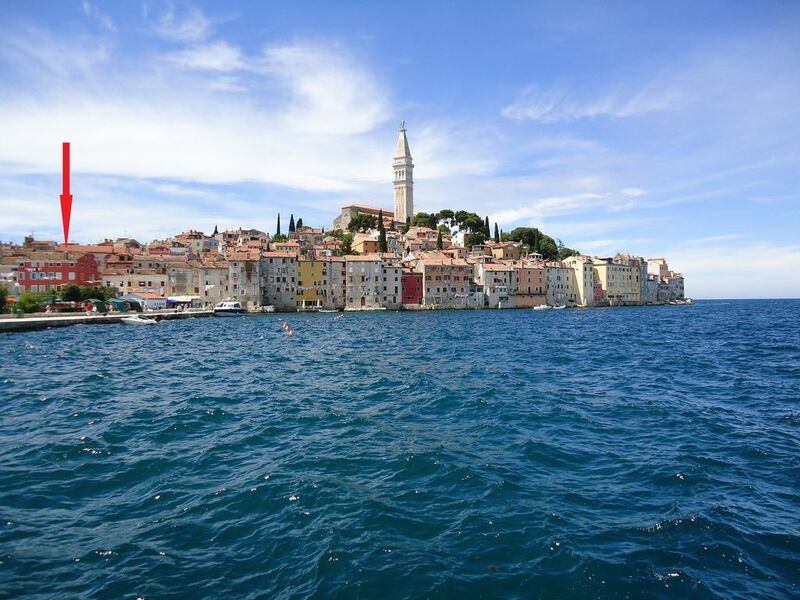 We would love to return to Rovinj someday and would not hesitate to rent from Zeliko. Fantastic apartment and the best hosts. We had a wonderful time in Rovinj. Swimming, fantastic food and perfect weather. The apartment was great with everything you could ever need. The owners go above and beyond to make your stay perfect recommending places to visit and great restaurants. Supermarket and bakery are all close by as well as great swimming spot. We had to replace a tyre and our hosts even sourced one for us.We would have been in trouble without them. Great location in the old town overlooking the marketplace. Very spacious one bedroom apartment with outlook over the bay. Here you really feel the buzz and vibrancy of Rovinj yet still able to get a perfect night’s sleep in a very comfortable bed. The weather was quite warm during our week’s stay but there was always a wonderful cooling breeze wafting through the apartment. Zeljka and Zeljko are the absolute perfect hosts. Nothing is a problem. Your every need is instantly attended to. We particularly valued the meet and greet and help with the luggage. Zeljko is far superior to any tourist office. Thank you both so much. If you really want to immerse yourself in Rovinj and totally soak up the atmosphere then you have to stay here. This apartment is very well located in Rovinj old town with a great view overlooking the sea.It is perfect for self catering - the fruit and veg market is outside the door as is the butchers and the fishmongers. A really good bakery is two minutes away. The apartment itself is very well equipped, it had everything we needed for a comfortable and very happy stay. Zelka and her father couldn't have been more helpful and Rovinj is a lovely, relaxed town. Enjoy! Parking is provided in the vicinity of the apartment ( 5 min walking distance).Please enquire about details.